But this book serves as more than just a simple travel guide that merely lists hotels, restaurants, and nightclubs. It also provides insight into the customs, etiquettes, and protocols of the people on Vulcan. This is a culture ruled by logic, but through all of their years of interaction with humans from Earth, they’ve become better accustomed to the more emotional aspects of other people and more welcoming and tolerant to outworlders. There’s plenty for visitors to do and see on Vulcan, but before you do, you can familiarize with the sections in the book regarding giving the Vulcan salute, how to dress appropriately (it’s the desert), and language tips, most notably what’s likely the most crucial thing to know — how to ask where the restroom is. If you’ll be taking an extended stay on Vulcan, there’s details on where to go to start on the path to achieving Kolinahr (you’ll purge those pesky emotions — recommended for those with anger management issues), and how to participate in a wedding ceremony if you find yourself faced with a marriage challenge Koon-ut-kal-if-fee. The book has some nice extra touches, such as an Introduction by the man himself, Spock (who at the time of his writing was the Vulcan Ambassador to the Federation), as well as a sidebar from Spock’s human mother Amanda, who writes that she knew since she was a teenager that she wanted to live on Vulcan (no surprise that she’d fall in love with Spock’s father, the Vulcan ambassador to Earth). Writer Dayton Ward has been crafting Star Trek stories since the late 1990s, with novels Star Trek: That Which Divides and Star Trek: From History’s Shadow, so he’s a perfect choice to pen this travel guide. Ward keeps his narrative simple and his details informative, while infusing humor throughout as well as while injecting several references to the rock band Rush, which automatically earns him major bonus points with me. Rush is my favorite band of all time, so seeing entries on visiting The Fountains of Lamneth and the Temples of Syrinx were a real thrill for me. 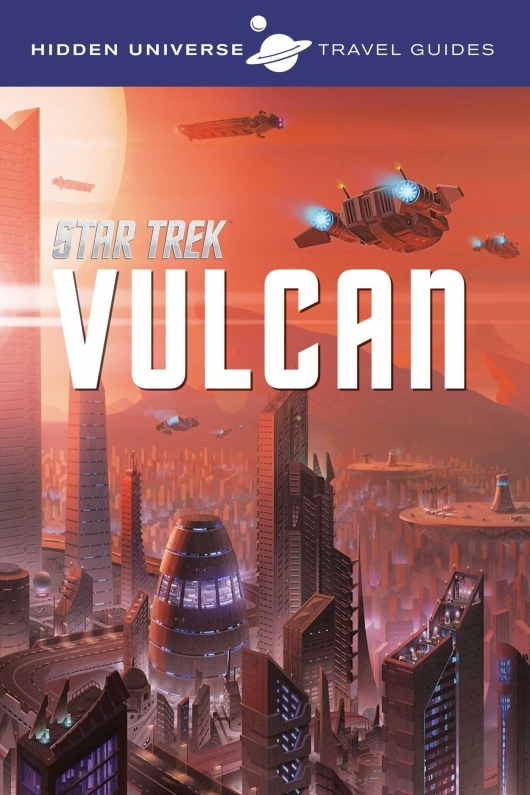 Along with Ward’s exhaustive guide to all things Vulcan travel, A Travel Guide to Vulcan! contains beautiful, enticing artwork, regional maps, and instructional illustrations by Livio Ramondelli and Peter Markowski, which serve to really enhance this outstanding guide book. Hidden Universe: Star Trek: A Travel Guide to Vulcan is an essential addition to any Star Trek fan’s library, especially those who have always longed to see Spock’s home world and learn everything there is to know about it.